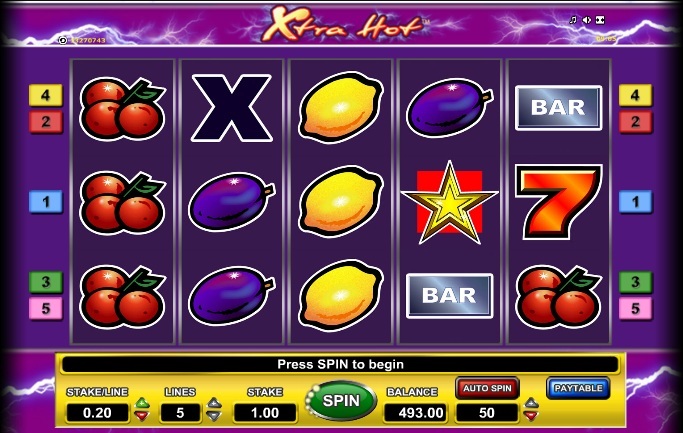 Similar to Sizzling Hot, Novomatic's Xtra Hot is a basic-looking 5-payline online slot with lots of stacked symbols and a fruity theme. It doesn’t have a bonus round like other slots such as Lucky Lady's Charm or the aquatic-themed Dolphin's Pearl but for simple charms it's hard to beat. 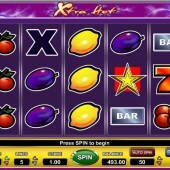 It doesn’t take long to work out how to play Xtra Hot and its simplicity is part of its appeal. Winning lines are from left to right when the same symbol forms one of the paylines. The only exception is the star Scatter which can appear anywhere on screen to qualify for a winning payout. The star Scatter also features in Sizzling Hot Deluxe. If you fill the reels with the same fruit symbol then you will get a multiplier up to 5x. The best we achieved was the first 4 reels with the orange, which gave a 4x multiplier and a very nice payout. Like Sizzling Hot, this slot machine has a 95.66% payout (RTP) online. This is pretty decent and goes to show that you don’t always need a game that has free spins to get a decent return. While fans of more sophisticated fare like Betsoft's 3D offerings may get bored pretty easily, if you enjoy some mindless fruit-based fun across about two paylines, there's no need to venture anywhere else.